10비트 YUV 또는 12비트 RGB로 최대 4096 x 2160의 60p를 지원하는 12G-SDI에서 SD/HD/Ultra HD/4K DCI를 캡쳐/재생! 12G-SDI를 통해 두 개의 풀 프레임 DCI 4K 입/출력을 지원하는 최고의 디지털 시네마 캡쳐 카드! 듀얼 링크 멀티 레이트 12G-SDI 연결이 탑재되어 SD/HD/Ultra HD 그리고 최대 Ultra HD 60p로 작업할 수 있을 뿐만 아니라 풀 프레임 DCI 4K를 4096 x 2160 해상도의 최고 60p로 작업할 수 있습니다! 10비트 YUV 또는 풀 컬러 대역폭의 12 비트 RGB를 캡쳐하세요. AES/EBU 오디오, 업/다운/크로스 컨버젼 뿐만 아니라 내장 3D 스테레오 스코픽 출력을 풀 대역폭인 4:4:4:4 RGBA로 실행! DeckLink보다 더 다양한 비디오 포맷과 연결을 지원하는 캡쳐/재생 카드는 없습니다! 2개의 12Gb/s SD/HD/2K/4K 입력. 싱글 링크와 듀얼 링크 4:2:2/4:4:4:4 지원. 2D/3D 전환 가능. 2개의 12 Gb/s SD/HD/2K/4K 출력. 싱글 링크와 듀얼 링크 4:2:2/4:4:4:4 지원. 2D/3D 전환 가능. 1개의 컴포넌트 YUV (S-비디오 및 컴포지트로 전환 가능한 3 BNCs 단자). HD/SD 지원 컴포넌트. 2채널 불균형 입력 (샘플 레이트 변환 장치 탑재). HDMI 타입 A 커넥터 (Ultra HD 4K 60p 4:2:0 지원). 8채널 임베디드 (SD/HD/Ultra HD 4K). SD, 720p50, 720p59.94, 1080i50, 1080i59.94 포맷 대응의 블랙버스트 또는 HD 포맷을 지원하는 모든 종류의 Tri-Sync. Sony™와 호환하는 RS422 데크 컨트롤 포트. 소프트웨어 컨트롤에서 시리얼 포트(TxRx) 방향 전환 제어 가능. PCI Express 8 레인 제너레이션 2. 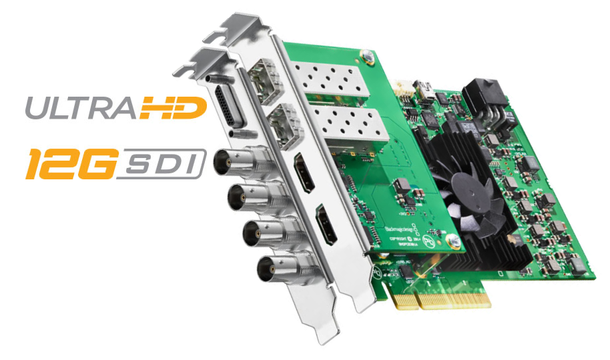 8/16 레인 PCIe 슬롯과 호환 (HDMI 메자닌 카드). 지원 : AVC-Intra, AVCHD, Canon XF MPEG2, Digital SLR, DV-NTSC, DV-PAL, DVCPRO50, DVCPROHD, DPX, HDV, XDCAM EX, XDCAM HD, XDCAM HD422, Apple ProRes 4444, Apple ProRes 422 (HQ), Apple ProRes 422, Apple ProRes (LT), Apple ProRes 422 (Proxy), Uncompressed 8-bit 4:2:2, Uncompressed 10-bit 4:2:2, Uncompressed 10-bit 4:4:4, Uncompressed 12-bit 4:4:4. Mac OS X, Windows, Linux의 8/16 레인 PCI Express 슬롯과 호환하는 PCI Express 8레인 제너레이션 2. Mac OS X 시스템은 PCI Express 슬롯을 지원하는 Mac Pro 컴퓨터가 요구됩니다. 동작 환경에 대한 자세한 내용은 고객 지원 페이지에서 확인하세요. 다른 지원 응용 프로그램:Steinberg Nuendo, Avid Symphony, Avid News Cutter, Tools On Air just:in & live:cut & just:play & just:live, Softron OnTheAir, MovieRecorder and OnTheAir CG, Flash Media Encoder, Wirecast, Livestream Procaster, Resolume Avenue 4, Sony Vegas Pro, Corel VideoStudio Pro X4, CyberLink Power Director, MAGIX Video Pro X4, Vidblaster Pro & Studio & Broadcast, Uniplay, Playbox AirBox, CasparCG, Magicsoft CG, Xsplit Broadcaster, Imagine Communications Velocity & InfoCaster. 3840x2160p23.98, 3840x2160p24, 3840x2160p25, 3840x2160p29.97, 3840x2160p30, 3840x2160p50, 3840x2160p59.94, 3840x2160p60. SMPTE 435, SMPTE 259M, SMPTE 292M, SMPTE 372M, ITU-R BT.656, ITU-R BT.601. 최대 비디오 파일의 3 라인까지 사용하여 VANC 캡쳐/재생. HD RP188. 폐쇄 자막. 8/10 비트 YUV 4:2:2 그리고 8/10/12 비트 RGB 4:4:4 (HD), 2K와 4K. HDMI 1.4b는 딥컬러를 지원하고 연결된 디스플레이를 자동 인식합니다. HDMI 입력은 복사 방지 HDMI 소스를 캡쳐할 수 없습니다. 컨탠츠를 캡쳐 및 분배하기 전에 항상 저작권을 확인하세요. 듀얼 스트림과 프레임 패킹 방식의 캡쳐&재생. 고품질의 내장 하드웨어 다운 컨버터는 SDI B에서 Ultra HD를 HD로 또는 HD를 SD로 다운 컨버트된 신호를 출력하며 SD는 컴포지트 및 S-비디오 출력을 지원합니다. 아날로그 비디오를 컴포넌트로 전환한 뒤 HD 및 SD 출력으로 선택 가능. 레터박스, 아나 모픽 16:9, 센터 컷 4:3 스타일에서 선택 가능. 고품질의 내장 하드웨어 업 컨버젼 기능으로 SD에서 720HD 및 1080HD로 변환하여 재생 가능. 4:3 필러박스, 14:9 줌, 16:9 줌에서 선택 가능. HD-SDI, HDMI, 컴포넌트 아날로그를 통해 HD 출력. 고품질의 내장 하드웨어 크로스 컨버젼 기능으로 720HD에서 1080HD로 또는 1080HD에서 720HD로 변환하여 재생 가능. Apple Final Cut Pro 내부 효과. Adobe Premiere Pro Mercury Playback Engine 효과. Avid Media Composer 내부 효과. DaVinci Resolve. Mac OS X 10.8 Mountain Lion, Mac OS X 10.9 Mavericks 혹은 이후 버전. Windows 7 64 비트 혹은 Windows 8 64 비트. 아날로그 및 RS-422 컨트롤용 브레이크아웃 케이블. 3년 제한 품질 보증 제공.